the daybook: nutrition inside and out: two tips! nutrition inside and out: two tips! On a scale from one to ten, how bad is it that it takes moving back in with your dad to find the self control to not eat bread (and sometimes only bread) for every meal? I don't know. We'll give it a three. It IS bread after all. When it comes to food, I'm not really a live-to-eat kind of person. I eat to live. Honestly, eating can feel like a burden to me, and sometimes I would love it if I could just feel totally full! All the time! And not spend any more time opening the fridge, deciding what to eat, because seriously, I just made lunch two hours ago, and there is no way it's already dinner time. The problem with food being low on my totem pole of priorities, is my tendency to wait. In the past, I would wait until I absolutely had to eat something, and had to eat it NOW, at which point, I'd reach for the english muffins/butter/jam and carb up quickly until I felt full again. Isla was basically created on english muffins. We'd go get our ultrasounds done, and there she was. Just this tiny little baby and like, 10 english muffins. The point here being! Over the past few months of living with my dad and adopting my family's lifestyle and eating habits as my own, I've somewhat on accident, changed the way I look at food. Not to say that I don't have a stack of frozen chocolate at the top of the freezer. Because I do. But I stopped the bread habit. And generally, I try to be more mindful of practicing self-care by feeding my body with love. Nutrient-dense, energy-sustaining food, that makes me feel like the best version of myself after I've eaten it. This is almost never easy. Not even almost. It can seem like it's just plain never easy. However! I picked up a little trick from my parents that's totally changed everything about how I measure what I'm eating and what to look for when grocery shopping. So here's the trick! 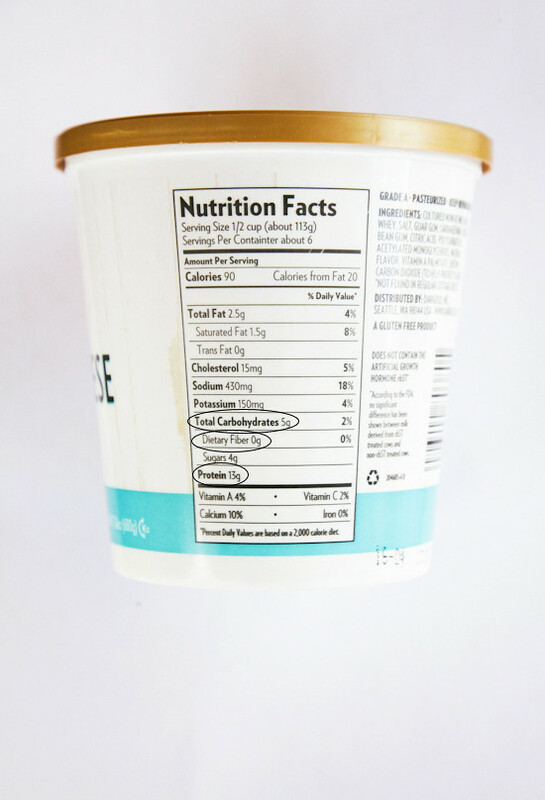 On products with nutrition labels, like this cottage cheese carton above, you'll find the total number of carbs first. Then from that number, you'll subtract fiber, and then protein. Whatever number you end up with, (in this case a -8), will act as the measuring tool to determine if it's something you want to eat or not. A number 15 and below is decent. 10 and below is good. And 5 and below, down into the negative numbers, is pretty stinking great. This is how I discovered that Clif bars are a whopping number 30, and wow, really are designed for intense intervals of hiking and NOT a bedtime snack. Revelation. I'm not saying that this method is perfect for determining everything you eat. The really great things don't necessarily come with a nutrition label. And chocolate rice cakes alone are going to be a really small number, but that doesn't exactly mean they're giving you any good stuff. But as far as interpreting all the fat-free, sugar-free, gluten-free labels? It helps make things a little easier. Nourishment has sort of become a theme in my life in the past few months. Seriously just to survive mentally, emotionally and physically as the sole caretaker of these two babies, I felt like I needed to arm myself with a few really good things. Good food, regular exercise, and a nighttime routine that humanized me again. My favorite thing has been a hot shower, followed by a small vat of moisturizer, and then finally plugging my headphones in and listening to various meditation prompts or Amy Poehler (meditation in it's own right) until my eyes droop. A few weeks ago I started incorporating Biossance's Revitalizer (to be launched July 1st!) into the routine, and the honest truth, it's sort of been a game changer. First of all, it's pretty. It must be said. It totally legitimizes my beauty routine in a way that a jar of melty coconut oil just can't, you know? Second, it makes me glow. I've mentioned glow before. Glow is important to me. You know the feel of make-up primer? Like, so soft that when you put it on, you're rubbing your face like, "What isssss this??" and you realize that your cheek has turned into an actual baby's bottom? It's like that. But as a moisturizer. It's truly a remarkable combo to have sink into your skin. The key ingredient being Squalane - a moisturizer already found naturally in our bodies- which I love. I've used it to smooth my hair, boost and lighten my winter foundation, and I would probably use it on my cuticles if I ever get around to paying attention to them. Biossance is also doing some pretty incredible good in the world. For every bottle sold, a malaria cure will be provided to a child at a rural clinic in Uganda. And if they reach 10,000 cures before the end of this month, Biossance will double the number. Hopefully, we can help them reach that. Moisture on! 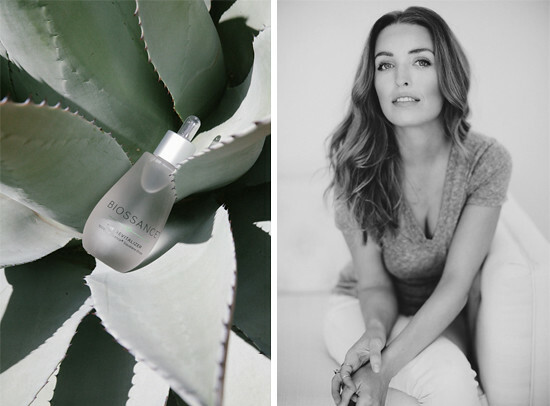 Thank you to Biossance for sponsoring this post, and thank YOU so much for your continued support and kindness. Loving the carbs - fiber - protein trick! Definitely going to pay attention to that now! That counting label business is the single best thing I've heard all morning. that label trick totally makes sense, since the higher the protein, the leaner your bod will be. cool! i recently cut out sugar after hearing many many success stories from weight loss to hormone balance (uh hem) to skin clearing... we'll see how it goes! Thanks for such an easy way to look at our nutritional labels! I'll be trying this trick out. I feel the same way you do on the topic of food/ eating. I would be perfectly content if I didn't have to make dinner another night! This is an awesome way to decide what to eat! I need to start doing this, because I'm definitely one of those people who like to "eat to live" haha! Love this post and love you!! You peeked inside my brain and described my relationship with food perfectly. I love me some great delicious food but day to day it always seems like such a hassle. Especially when we get into making lunches for work! As a total 'live-to-eat' person, I realized recently that my relationship with food isn't too different from yours! I love food and all things related to it, but I don't often have the time to cook something that I truly enjoy and satisfies cravings, so I reach for toast with peanut butter or an egg salad sandwich. I'm a full-time nanny and when I started making purees and finger foods for the two little girls I watch I realized how terrible my eating habits were. I've started focusing on eating primarily fruits and vegetables, raw as often as I can, and everything has kind of fallen in to place. Not that it hasn't been hard, but it's made me feel better and that makes it easier to keep up with. I totally believe that cutting carbs is the key and shortcut to burning fat and getting in shape. I read labels, I count the carbs-therefore I can burn a lot in my day to day activities that come naturally. So glad to see you and your followers feel the same. I had been using coconut oil for everything and then I did some research and found that jojoba oil was tops in going above and beyond coconut oil and few know it. It's fast absorbing so it penetrates hair and skin very fast and doesn't just 'sit' on the surface. You may want to try it. I can give you sources. And Borage oil is outstanding as a facial moisturizer alone or mixed with your favorite face lotion. Again, I'd be happy to share the info I have. Thank you for a great post---I am so looking forward to following your blog. love this post! great trick! Amazing post! I love your Nutrition Label trick! I'm actually really excited to try it out! My husband is going to love this too as he trains for the STP. And I totally feel ya with the ugly jar of coconut oil. There's one sitting on my bathroom counter right now. Thanks for another amazing post. I LOVE food. Always have. It brings me so much joy and as I've paid more attention to what I consume, I've learned how different things make me feel. My ex felt the same way about food as you did, and I'm embarrassed to say it caused a lot of fights because I'm really passionate about my food! haha. If you're a reader and are interested, I highly advise reading, "Keto Adapted" by Maria Emmerich. Given, she is a bit extreme and it would take everything in me to crack down on myself and eat this way but the benefits that she talks about are good motivation. My body craves carbs and sugar because that's what I put into it. Her explanation to why our bodies crave what they do is so interesting. I have to start doing it! I've read that squall ante is sources from sharks livers and that it takes 3000 sharks to make one ton of the stuff. Do you know if this is true?